It was love at first sight when I saw him starring Messenger. Since then I've become addicted to his doramas and movies and to the person himself ^^ He is such a great actor and wonderful person. His doramas are always great and fun to watch. I love Tsuyoshi Kusanagi very much. he's a good actor, i can't wait for his new drama to come out!!! ^_^ he seems kinda quiet in smapxsmap compared to the other 4... but when he speaks, he has that unique sense of humour. tsuyoshi is a cutie! He's really geeky looking but a great actor! Loved his character in Sutaa and Koi Ni. I've not heard and SMAP before but he's got a 'stong' voice which is noticible now that I think of it. I do not why I like him a lot. Maybe started when watching Suuta No Koi. His role represents a lot of ordinary people like us. He is one of the main trigger for me to like doramas. One of the skinniest actor I've ever seen XP But his acting quality is very good. I love Tsuyoshi in ALL of his dorama. My mot favourite one is Sensei, shiranai no? and Messenger. Out of all the men, I would most like to marry him! I need to see more of his dorama. But his singing voice is what makes me love him! The best actor in JE and one of the best actor in Jdorama world.His looks and his voice is so rare and unique. So unlike other Johnny's member -he can act, naturally!! And one's watching can resent to his true form. Great actor. I liked him best in Sutaa no Koi and also enjoyed his performance in the movie Yoomigaeri. Great Actor with a wide range. Loved his work at "Boku no Aruku Michi" and "Ninkyo Helper". A very good actor!!! I love his down-to-earth nature. He's a nice dude and a member of SMAP!!! 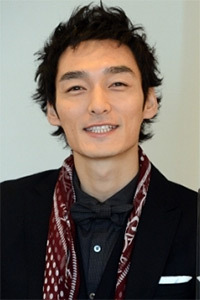 I really enjoyed him in Sensei Shiranaino, Narita Rikon, and Sutaa no Koi. Very natural actor. very versatile artiste... good at making fun of himself in smapxsmap and good at acting! He's a very good actor & I've enjoyed watching the dramas he's done! Excellent in showing human emotion! I want to see all of his shows! A cutie that has a good singing voice and is a great actor! I LOVE TSUYCHAN!! He is my inchiban daisuki member in Smap! He has proven himself with the last few doramas and movies. This guy is perfect for acting. I recommend his stuff.